Annual mean levels of nitrogen dioxide (NO2), a toxic gas, are two and three times the legal limit and World Health Organisation (WHO) guideline near London busiest roads with breaches even at ‘background’ sites. NO2 levels in London were the highest of any capital city in Europe in 2010 and comparable with those in Beijing before it took action for the 2008 Olympics. One wonders why the US Embassy is campaigning about levels of dangerous airborne particles (PM10) in Beijing and not NO2 in London. Air pollution matters. The Mayor has estimated 4,267 deaths were attributable to long-term exposure to ‘invisible’ PM2.5 in London in 2008 which is similar to the 4,075 from short-term exposure to air pollution during the Great Smog of 1952 (when we knew nothing of the health impact of long-term exposure). Only smoking causes more early deaths. Scientists are beginning to identify other serious health effects such as traffic-related air pollution being responsible for 15-30% of all new cases of asthma in children and of chronic obstructive pulmonary disease in adults aged 65 and over. The latest scientific research, consistent with earlier studies, has produced preliminary results showing that the poorest in London are exposed to significantly higher NO2 concentrations than those with more income. The Mayor estimates that around 80% of PM2.5 emissions in London in 2008 came from road transport with diesel vehicles a particular problem. Scandalously, the Government blames mainly Euro engine standards for oxides of nitrogen (NOx) from diesel emissions, now classified by the WHO as carcinogenic to humans, for failing to reduce NO2 concentrations when no NO2 emission standards were set. Governments have been aware of problems with diesel emissions since 2005 but have continued to incentivise its use (with most of the increase in NO2 as a percentage of NOx occurring prior to 2004). For example, cars, which produce 21 times the PM10 and twice the NOx emissions in grams per mile of their petrol equivalents, have increased in market share from 14% to 52% of sales between 2000 and 2011. Equally serious, the Government seeks to dismiss legal breaches of NO2 by focusing narrowly on the health effects of the NO2 molecule despite concentrations of NO2 often being strongly correlated with other toxic air pollutants. Last month, the European Commission (Commission) rejected the UK’s application to delay compliance with one or both of the NO2 annual mean and hourly limit values in 12 of 24 zones from 1 January 2010 to 1 January 2015. The Commission’s decision noted the UK had not applied in September 2011 for a time extension for 16 further zones, for which compliance was expected by 2020 and in London’s case by 2025, despite the Commission initially considering it had done so. In response to a complaint from Clean Air in London (CAL), the Commission has asked the UK authorities to provide them with clarification on: the process by which the UK obtained a time extension until 2011 to comply with the PM10 daily limit value in London; the exceedances at Neasden Lane, Horn Lane and Upper Thames Street; the future monitoring stations they will use to communicate compliance; the use of pollution suppressants near monitoring stations; and the situation with regard to air quality plans and programmes for NO2. The Commission’s decision and response to CAL’s complaint arrived hours before CAL gave evidence to the House of Commons Environment Food and Rural Affairs select committee (EFRACOM). The Committee questioned Government officials (see from time 1:11) over the sharp inconsistency between: the coalition Government’s stated commitment to ‘work towards full compliance with European Air Quality standards; and Defra’s recent statement ‘Working in partnership with other Member States, we will also use the European Commission’s review of air quality legislation, expected in 2013, to seek amendments to the Air Quality Directive which reduce the infraction risk faced by most Member States, especially in relation to nitrogen dioxide provisions’. CAL urges EFRACOM to investigate thoroughly the Government’s real commitment to air quality standards and demand a vote in Parliament on it. It seems inconceivable that Parliament would vote to undermine UK and international air pollution laws. In a similar vein, the Mayor has admitted in a recent response to an information request from CAL, that the Air-quality Initiative of the Regions (AIR), which he founded and represents 12 cities and regions across Europe, ‘emphasises that… The revised Directive shall include a degree of flexibility that allows the specific characteristics of our Regions to be taken into account’. Astonishingly, the Mayor has refused to disclose further information on the grounds ‘its disclosure would adversely affect international relations’. The London Assembly’s Health and Environment Committee is investigating the Mayor’s actions after no commitment to new measures were included in his Manifesto. Well over a year ago, the Olympic Delivery Authority (ODA) disclosed that congestion from the Olympic Route Network and related traffic arrangements (ORN) would cause ‘temporary and local breaches’ of air pollution laws. This expectation has been confirmed in two parliamentary hearings and a Transport for London report. Traditionally these impacts have been mitigated during Games-time by an ‘odd and even’ number plate ban, as in Beijing, or the ‘Big Scare’ which plays mind-games with drivers. For four years, CAL has argued instead for one or more inner low emission zones, like over 50 in Germany, which would have achieved the 30% reduction in background traffic needed to operate the ORN smoothly by banning only the most-polluting diesel vehicles including cars. Such a zone would have guaranteed traffic reductions and delivered a legacy. Lord Coe wrote to CAL in April 2008 setting out a bold and positive vision for air quality during the Olympics. Frankly, Lord Coe, the ODA and transport sponsor BMW have done the best possible within their available powers to deliver on this vision. But, so far, Mayor Johnson has let down the organisers and Londoners by opting for pollution suppressants to tackle traffic hotspots during the Olympics and the Big Scare backed by hundreds or perhaps thousands of local traffic restrictions. The Big Scare has already started with the Mayor advising all drivers to avoid central London, the ORN and venues unless ‘absolutely essential’. Londoners are likely to be infuriated by these restrictions even if they succeed in keeping the ORN working smoothly. The Department of Transport has also let us down, for example, only ‘now’ considering mitigation of the increase in NO2 levels for Hounslow residents arising from the suspension of the M4 bus lane which will next week become part of the ORN (probably resulting in further increases of NO2 as all traffic, not just buses, gets pushed closer to residents). Other Government departments have failed to protect the public from the dangers of air pollution. Defra, in particular, still refuses to issue a media release about air pollution unless one pollutant, ozone, is expected to be ‘High’ on its (small) monitoring network. The highly regarded Commission for Sustainable London 2012 listed ‘awareness raising in the event of any Games-time poor air quality episodes’ as one nine important issues still to be resolved in time for the Games. It looks belatedly as if such preparations are now being made for visitors to the Games. It’s time the Mayor and the Government moved to the starting blocks. We need proper public warnings about congestion and air pollution during the Games, particularly if we have a smog episode like 2003 or 2006 which could affect long distance athletes and the general population. As importantly, the Mayor and Government must ensure a clean air legacy from the Games through: a permanent reduction in background levels of traffic and harmful diesel emissions; and media releases to warn Londoners and others during smog episodes for any pollutant in future. London must tackle air pollution, as it did after the Great Smog, and show the world how to address wider sustainability issues through a mixture of political will, technology and behavioural change. This is the fifth in a series of six articles being written for PoliticsHome by Simon Birkett, Founder and Director of Clean Air in London, about air quality in the lead up to the London 2012 Olympics. Simon Birkett has been presented personally with the London 2012 Sustainability Ambassadors Award for his outstanding contribution to achieving a truly sustainable Olympic and Paralympic Games in particular for his focused commitment to tackling air quality, climate change and sustainability issues. Other topics in this series include health impacts, legal issues, sources, solutions and indoor air quality. 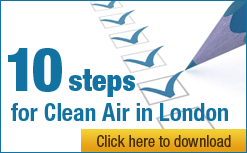 Full versions of all these articles, which include further links and references, can be seen on Clean Air in London’s website.